Have Astronomers Spotted A Forming Planet In Action For The First Time? Above: Image of the dusty disk around the star HD 169142 obtained with the Very Large Array. The positions of the protoplanet candidates are marked with plus signs (Osorio et al. 2014, ApJ, 791, L36). The insert in the upper right corner shows the bright infrared source in the inner gap, as observed with the Very Large Telescope. (Reggiani et al. 2014, ApJ, 792, L23). Two independent research teams think they've observed precisely this around the star HD 169142, a young star with a disk that extends up to 250 astronomical units (AU), roughly six times greater than the average distance from the Sun to Pluto. "This structure already suggested that the disk was being modified by two planets or sub-stellar objects, but, additionally, the radio data reveal the existence of a clump of material within the external gap, located approximately at the distance of Neptune's orbit, which points to the existence of a forming planet," said Mayra Osorio in a news release. Maddalena Reggiani from the Institute for Astronomy in Zurich and colleagues then tried to search for infrared sources in the gaps using the Very Large Telescope. 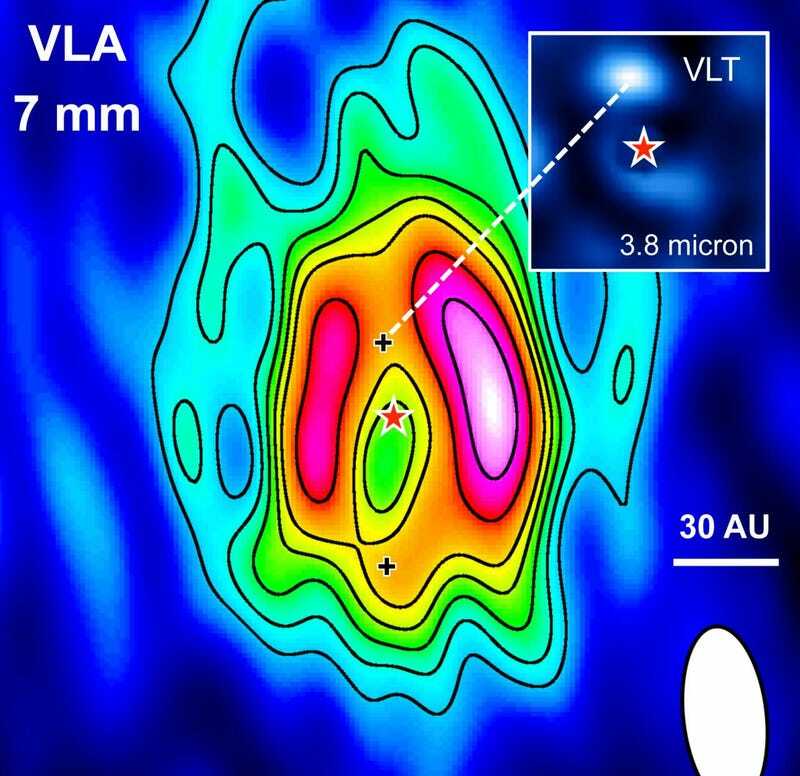 They found a bright signal in the inner gap, which likely corresponds to a forming planet or a young brown dwarf, an object that isn't massive enough to kick start nuclear fusion. The team was unable to confirm an object in the second gap, likely due to technical limitations. Any object with a mass less than 18 times Jupiter's mass will remain hidden in the data. Mayra Osorio from the Institute of Astrophysics of Andalusia in Spain and colleagues first explored HD 169142's disk with the Very Large Array (VLA) in New Mexico. The 27 radio dishes configured in a Y-shape allowed the team to detect centimeter-sized dust grains. Then combining their results with infrared data, which traces the presence of microscopic dust, the group was able to see two gaps in the disk. One gap is located between 0.7 and 20 AU, and the second larger gap is located between 30 and 70 AU. In our Solar System the first would begin at the orbit of Venus and end at the orbit of Uranus, while the second would begin at the orbit of Neptune, pass Pluto's orbit, and extend beyond. This post by Shannon Hall originally appeared at Universe Today. It has been republished with permission.